The mod continues to make good progress, despite real life keeping me busier than expected. 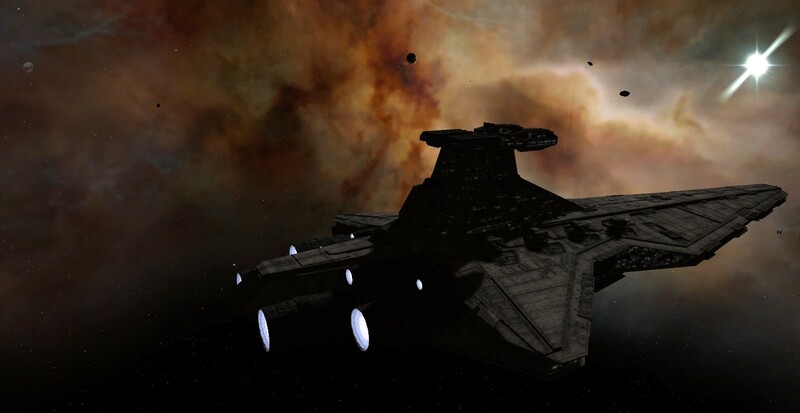 Check out a possible look for the main menu screen and some Super Star Destroyer eye candy. I am not that much into Star Wars, more of a StarTrek/Babylon 5 guy, but i have to say, this looks great! Especially this picture with SSD being constructed, just wow! Good work. The planet texture is awesome BTW. Thank you. I know what you mean, I'm a Star Wars guy only started watching Star Trek the last few weeks to try and understand it (sadly Babylon 5 is not on Netflix but from what I've seen it's great). From a mod perspective though I think Star Wars works better with Sins because the technology levels and fleet sizes are similar. Yes the SSD is the titan. There is no death star because this mod is set about 5 years after Endor in its own alternate timeline where the Sins races invade the Star Wars universe in an attempt to flee from whatever is chasing the Vasari. So the Death Stars have already been destroyed, and Darth Vader has decided that their lackluster performance thus far doesn't warrant building another one. (Oh, and don't tell the Star Wars fanboys this, but you actually can blow up planets. I just think its over powered). Oh the ironic similarity between the two hasn't escaped me, but we might find out what is really chasing the Vasari one day, which would make the mod really archaic. Also how could they be on the verge of invading two different galaxies at once? Is this mod still alive or is it now on the back burner? Actually its on the front burner, but a lot of the stuff I've been messing with has been behind the scenes stuff rather than new models, so I haven't had much to show. Good to know, thanks for your work! Anyone else ever notice how well the Advent are described as a race of powerful Force adepts? Maybe you can make something of it. They have telepathy strong enough to detect ships from hundreds of light years away. The Unity itself sounds quite a bit like a mass Force bond. They use telekinetic powers to reinforce armor, launch their orbital bombardment rods, and in the case of the Guardian, Force push ships away. Their mind powers make most Jedi and Sith seem insignificant by comparison. Induced Reverence, Suppression, Animosity, Deceptive Illusion, and plenty of others. Then there's Induce Hysteria...which is basically every Sith Lord's fantasy. Oh yes, I've made use of the similarity in the lore already. Though in my interpretation the unity is an energy field similar to the force but not the same. The Force is generated in small amounts by all living things, the Unity is created by the interconnectedness of its members. As a result the unity very much cares about adding members to its collective to strengthen itself, while the Force is generated whether you know how to use it or not, so Force users don't need to proselytize. This mod is absolutely amazing even if it's alpha. the SFX are brilliant, and the faction shown (Empire) is a lot of fun to use, much more than other mods. I cannot wait to see how it develops. It deserves a download just for featuring the best Executor Model I have ever seen. I wish it would also tackle Old Republic Factions, but que sera, sera. Everything is a work of love, from abilties to icons. Bump just to tell people the first alpha has been released. I've been playing nothing else for the last week or so. Stayed up till 5:30 am a few times and just showered and went to work. Got lots of good screen shots up too. Enjoying this truly am I! I have only played as the Empire so there is so much more to delve into. Normally I only play Sacrifice of Angels 2 (and as of a few months ago Armada 3) but the Empire mixed with the E4X mechanics has truly been inspiring. It makes me want to be a better Emperor. I lowered the income level like you said and I think that was a good call. I like the progression of the techs and it actually feels like it matters which techs you invest in at different stages of the game. I'm going to say it, you have to "think" about what you are trying to accomplish. I don't feel like a steam roller with a bad parking break perched on a mountain top when I hit the 30 minute mark. So thank you. I didn't think I would ever find another mod that I like as much as SOA2. I'm glad I took the "red" pill. I am getting a mini dump check your download page, noticed my checksum is different. You said it should be 107265183 but mine is 101503755. This is all from a fresh install as well as the mod was from a fresh install. I hit apply changes and it crashes. 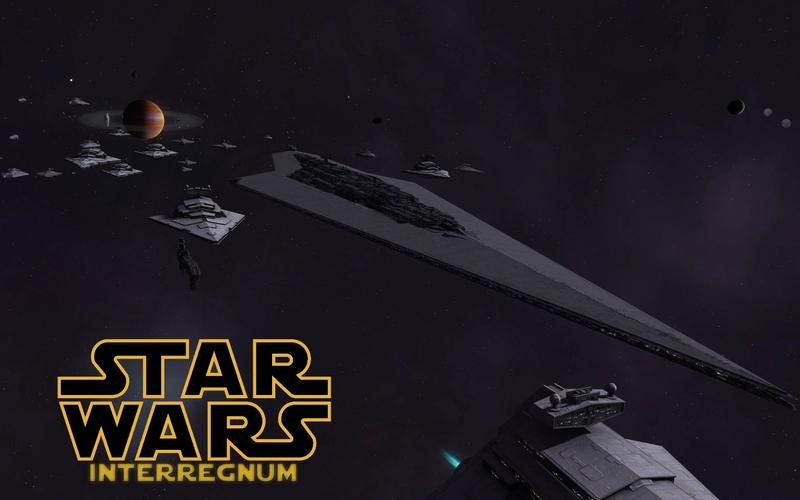 Interregnum goes above the main E4X mod, and all E4X addons go above Interregnum. Flip the order. E4X is on the bottom, put Interregnum on top of it, then any minimods you may want to use. There's a picture with the orders for everything here. I see, not sure why I read the readme wrong. Ill give it a try thanks for the fast response. For anyone interested, I've started a list of all characters and units that are found in the mod here. I've also added a small list of planned future additions, which I should complete in the next few days. im playing the supposed alpha. its a complete joke. even as a alpha this is the BEST mod ive tested! imperal fraction is total fun to play. a wish: there are many strike-craft around. thats not good performance wise. 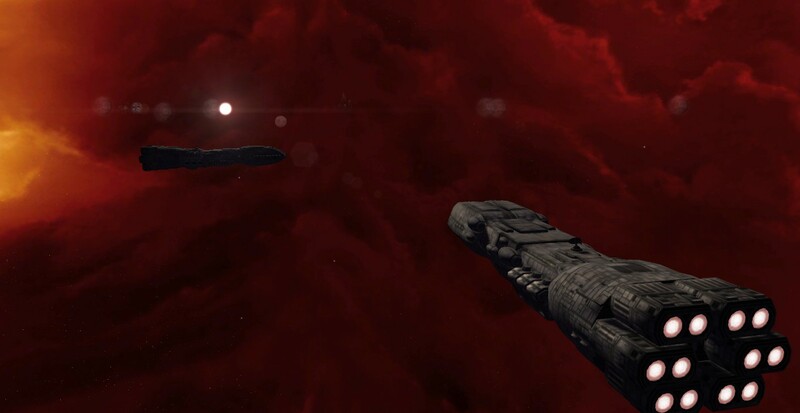 is it possible to perhaps merge the squadrons into a single stronger strike-craft as in a minimod in SOGE? ive ran i a strange bug: everything was fine for many plays. in the current game i cant build the executor. it builds around 3/4 and then stops. even the build animation of the factory stops. a clue why? i tried a former savegame, scuttling the factory, a different planet, with or without no superweapon optional mod; nothing works. (when scuttling a titan-factory you can upspeed the planets ship-building speed twice or even more times, intentional oder exploit?). Glad you're enjoying it, though the first two sentences had me worried there. The strikecraft counts have actually been reduced compared to Vanilla Sins. No squad has more than 6 strikecraft, while the Advent fighter squad used to have 12. I may make such a minimod in the future but I'm worried that it will create more of a balance problem in this mod, since antifighter units in SoGE have that ability that instantly kills also strikecraft around them. Having the entire squadron's HP in one fighter would make it harder for flak frigates to kill them off before they inflict serious damage, even in large numbers. Are you sure you researched the final Star Dreadnaught research tech? Just like Vanilla Sins you need all four to be researched, each allowing you to build it 25% of the way. thats a point about strike-craft. im not a modder. the only bad point about this mod is the bad performance, which even led to a few minidumps and me playing small fleets and maps. The crash and lag issues usually have separate causes. Random crashes are usually the game running out of available RAM. If you've played SoGE you may be familiar with Large Address Aware, so you can try that if your computer has at least 4GB of RAM. Otherwise try reducing your texture quality settings (ship/structure/planet detail) to reduce RAM usage. Lag problems are indeed usually caused by your CPU being overwhelmed with things like strikecraft. I've done what I can by reduces strikecraft somewhat, slashing mine number and cutting the number of trade/refinery ships, as well as making carriers use more fleet supply to reduce the number of squadrons around. You can also try stacking your Empire tree and hiding trade ship icons if you aren't already.